First year FSU student Tali Nir has been working as a research assistant for FSU Art Assistant Professor in Art Rob Duarte throughout the Fall 2014 and Spring 2015 semesters. Duarte’s project involves developing a process for laser engraving directly on 35mm motion picture film to create animation. The process is a high-tech analogue to the direct animation techniques practiced by early experimental animation pioneers Norman McLaren and others. This low-tech method of creating animation frame-by-frame, by selectively removing film emulsion using knives, pins, and other tools has a particular aesthetic and the laser technique being used by Rob and his assistant Tali have their own specific aesthetic qualities as well. Over the course of the last few months, Tali has been working to document, test, and practice the techniques being developed. 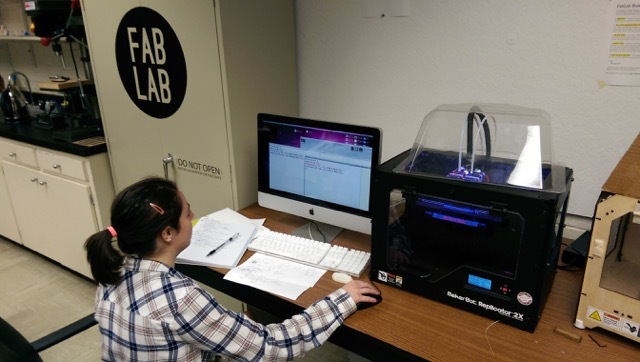 In the process she has learned a host of new technical skills including Adobe Illustrator, 3d modeling and printing, laser cutting and engraving, etc. She will present some of the work that she has been contributing to at the Undergraduate Research Symposium next Tuesday March 31 at the Tucker Civic Center, at the 15th Annual Undergraduate Research Symposium. As their work continues, Tali will be assisting Rob in the creation of actual animated shorts, which are connected to his research into the political history of the turpentine industry in North Florida.